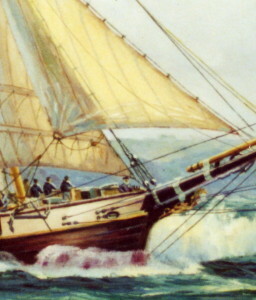 La Recouverance, the name of this schooner of war, with typical French humour, is that of the ‘red light’ district of the port of Brest. 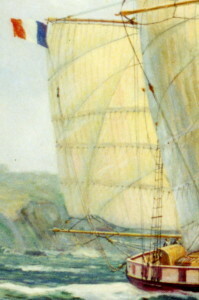 At the time of her launching, this fine painting was already on display as part of an invited exhibition in Brest of Gordon Frickers marine art. 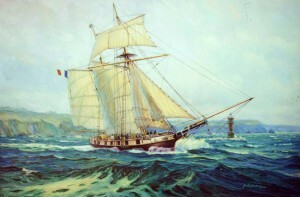 La Recouverance as shown here is sailing on ‘Le Goulet de Brest’ (the entrance to the roads of Brest). This superb replica schooner was built as the result of a bar room bet with a shipwright. I had the great pleasure of being among the thousands of people at Brest 96 who witness the launching of La Recouverance. By climbing a lamp post I was able to enjoy a fine view, Yachting World subsequently published several of my ‘lamp post’ photos taken that fine day. Amusingly, the cannon for La Recouverance were supplied by Martin Bibbings of the (English) Trafalgar Gun Company. La Recouverance is a beautifully crafted accurate replica of a typical French commerce raider of the ‘Nelson Period’, the Napoleonic Wars. Ships like her, private war ships, “privateers”, carried a government’s “letter of marque” giving them a warrant to attack & capture enemy merchant ships for profit but not neutral ships thus she was a pirate with a ‘licence’ in the eyes of many. 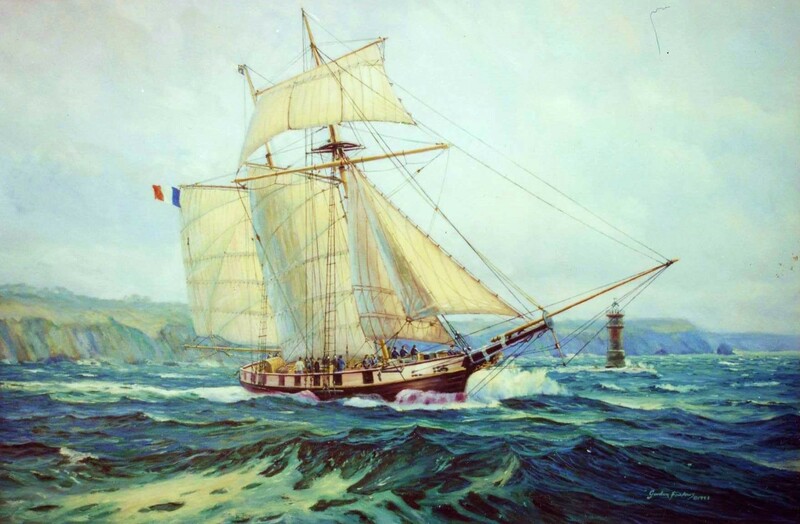 The letter of marque was also sometimes called ‘une lettre de course’, hence ‘Corsair’. 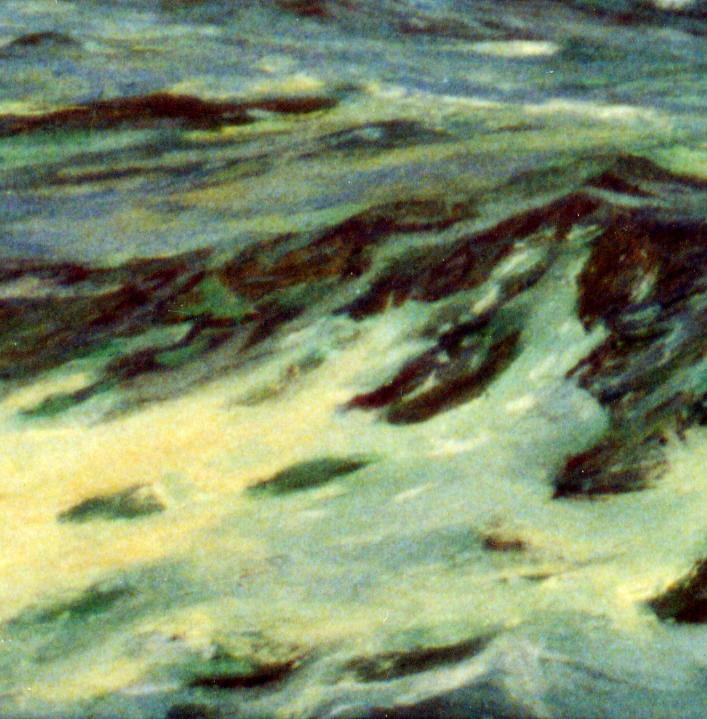 FR: Un corsaire est une personne (le plus souvent l’armateur, le capitaine ou le membre de l’équipage d’un navire civil armé) autorisée par une lettre de marque… de l’anglo-saxon « privateers ». 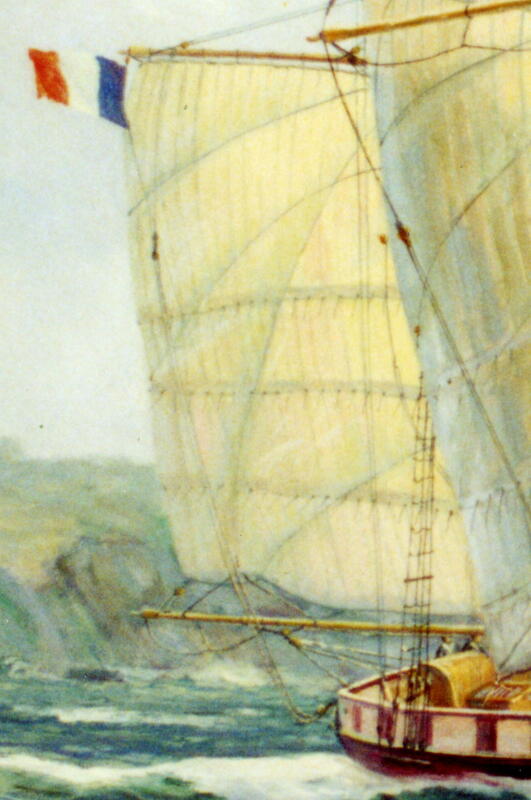 Later the term ‘corsair’ came to be more closely associated with North African Muslim pirates who had from the time Islam first over ran North Africa relentlessly attacked Christian vessels thereby doing much to prolong the post Roman period known as “The dark Ages”, and raided Christian lands as far afield as south west England, for loot, riches and slaves. The fate of any Christian taken by ‘The Moors’ was a grim one. America fought a brief war with the Moors however it was the British Royal Navy that eventually solved the problem of Moorish corsairs terminating the history with the bombardment of Algiers in 1820. French privateers like La Recouverance kept the Royal Navy very busy successfully captured some 10% of all British merchantmen. Some of the privateers became very wealthy men. A beautiful original marine painting, I am very happy to have sold this marine painting to good friends in Brest so am occasionally able to see it again. and in English, the ‘sailonboard‘ web site.